"A flavorful blend of veggies and spices, perfect served with crunchy French bread." Heat oil in a large skillet over medium-high heat. 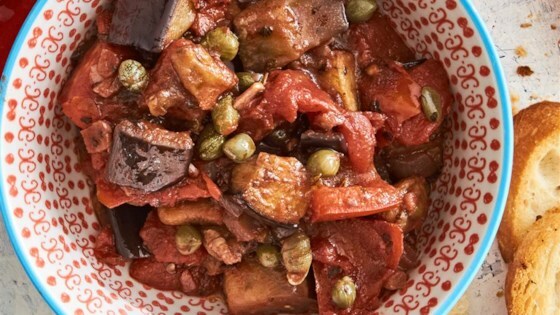 Cook eggplant, onion, garlic, oregano, cinnamon, allspice, salt, and pepper, stirring frequently, until onion is slightly browned, 7 to 8 minutes. Reduce heat to medium and add tomatoes, water, wine, and bay leaf. Simmer, stirring frequently, until eggplant is tender and mixture is thickened, 13 to 15 minutes. Remove from heat and stir in sugar, capers, and vinegar. Let cool 30 minutes, then discard bay leaf. Serve at room temperature or chilled. This dish is easy and delicious! I added some feta when the dish cooled slightly. I will definitely make it again! I left out the allspice and cinnamon. Added 1/4 cup kalamata olives cut in half. Added 1/4 tsp red pepper flakes. Omitted the capers and sugar and added 1/2 cup chopped fresh basil. Delish! This was very good! I served it with French bread as suggested. The only addition I made was adding 1/4cup of green olives. Very delicious. I substituted chopped green olives for the capons, I also added soy beans to boost protein for a well-rounded vegetarian meal.